And we're back! Thanks for your patience while we took a brief hiatus. We're back to posting regularly and we have some exciting new stuff planned for the weeks ahead (including a few book giveaways! ), so check back again throughout the week. Also, a note: if you're a reader and would like your blog added to our sidebar, please leave us a comment or e-mail us. We're hoping to start a list of links on our sidebar of all of our readers' blogs. I have never been much of a journaler. I have always been very much a future thinker and would rather write a list of goals rather than recount the events of a past day or flesh out my confusing emotions on paper. But within the past year or two I have been discovering the art of journaling as a spiritual discipline, discovering that journaling has the power to broaden my understanding of God, to help me find the splendor in the ordinary, and to help me see more clearly God's grace at work in my life. Now this is not saying that journaling is for everyone. Jesus (of course) set no example of journaling. Paul did not exhort his readers to journal. It is not so much a requirement as it is a tool. Ruth Haley Barton writes, "We cannot transform ourselves. What we can do is create the conditions in which spiritual transformation can take place, by developing and maintaining a rhythm of spiritual practices that keep us open and available to God." I have found journaling can create just such a condition. 1. Journaling allows me to see the hand of God at work in my life. This is the primary reason I returned to journaling, for I so often fail to see God's hand at work in my life and fall into despair over my own lack of spiritual growth. But flipping through one of my past journals, looking at the quotes, prayers, and reflections I've scribbled down, I am always surprised at how much I have learned and at how much grace God has poured into my life. 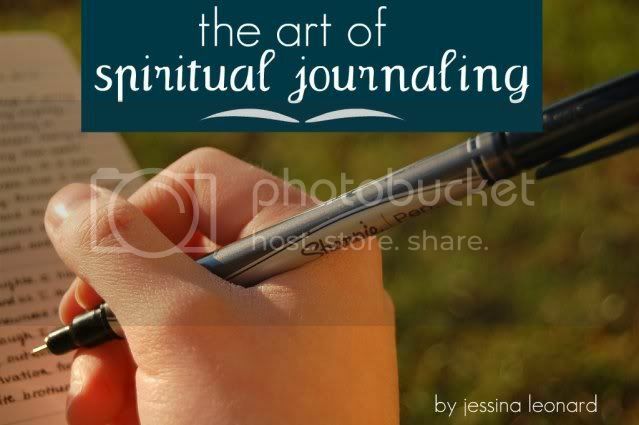 As Ann Voskamp writes, journaling "lets us see the soul areas the Holy Spirit is growing." 2. Journaling helps me "seek out the promise." One of the reasons I never liked journaling was because I only ever wrote in it when I was upset and angry, and so then reading back over it just became a horrible reminder of all the most unhappiest times of my life. But having matured since those times, I find now that when I am upset, writing about my emotions helps me "seek out the promise." Raging in my mind just leads to more raging, but I find that raging on paper helps me put things in perspective and remember the redemptive ending to all things. One of my favorite quotes on journaling, from Madeline L'Engle, pertains to this idea: "Nothing is inappropriate for a journal. God can take our grumpiness, our anger, our fear; and our fumbling words can suddenly be given new meaning and we glimpse a new understanding of redemption." 3. Journaling helps cultivate gratitude and helps me live in the "sacred present." I try to be intentional about writing everyday now, which forces me to write on the ordinary days when nothing spectacular or catastrophic has happened. And in actuality, most days are ordinary days. Writing on these days helps me to find the beauty in the ordinary. It helps ground me in the "sacred present," as George MacDonald termed it. The poet Mary Oliver wrote, "When it's over, I want to say: all my life / I was a bride married to amazement." Journaling helps me be amazed and grateful for the little, dirty, ordinary things of life, as it forces me to pause and take notice of them. There are several other reasons that I journal, such as for memory's sake, and as intentional practice for writing and fleshing out my thoughts. But these three reasons are the ones that make me keep returning to my little brown journal each night, even when I don't particularly feel like it. What about you? Does journaling come easy for you? How have you found journaling beneficial or not beneficial? Also, could you put my blog on the sidebar? Thanks! I love reading about new reasons and ways to journal; it's really inspiring! Could you put my blog on the sidebar too? Thanks for your kind words, Katie and Sarah! And we'll most certainly add your blogs to the sidebar, hopefully by the end of the week. I'm so glad you are back! This post was really interesting to me because I too, have trouble journaling. I was really able to relate to this post and I will definitely give it another try, thanks again! Thanks for this encouraging post! I have tried journaling before, and I think it's neat how I can have a record of God's work in my life that I can always look back on. It was a good way for me to sort out my thoughts and evaluate my spiritual condition. I also used my journal to write letters and prayers to God. Unfortunately, I am so busy right now that I don't have the time to keep up a journal. But for those who have the time, I would highly encourage them to start one! Will do, Paper Bird, Kate, and Chloe! We'll make sure to add you to our blog list once we get it together. And many thanks for your kind words and for sharing your thoughts. I always enjoy hearing about other peoples suggestions and ideas regarding journaling! Journaling is such a great to become closer to our King and to know Him more.It is perhaps one of the most impacting things you can do for your walk with Christ. Thank you for the lovely post! Could you put our blog on your sidebar? Thank you so much! Thank you for this informative, inspiring post. Journaling has so many spiritual, emotional, physical and life health benefits. I'll post this on my Facebook Journal Writing Therapy fan page. I've long been curious about spiritual journaling and you've answered my questions. Thank you. Journaling is a significant part of my life and the focus of my blog. (Please feel free to add it to your sidebar.) Thanks for this post.